Jesus Continued by J.D. Greear is a book about the Holy Spirit. 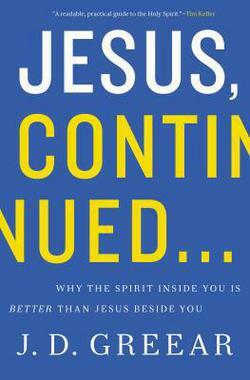 The subtitle is a better description about the big idea in Greear’s book – “Why the Spirit Inside You is Better Than Jesus Beside You.” If nothing else, the subtitle is bound to prompt discussion about the role of the Holy Spirit. Ultimately, if the discussion follows the basic flow of the book, the discussion will, in the final analysis prove fruitful and worthwhile. Greear gives practical illustrations how the Holy Spirit is experienced and offers biblical support throughout. Part three combines the best of parts one and two and challenges readers to surrender afresh to the Holy Spirit and to expect personal and corporate revival. He encourages readers to pursue the “ordinary means of grace” by 1) repenting of sin, 2) preaching the gospel faithfully, 3) saturating themselves in the gospel, and 4) persisting in prayer. Readers are urged to seek the Holy Spirit in prayer and living by faith in the promises of God. In the final analysis, Greear writes so that Christians will see the Holy Spirit is beckoning them to follow him. Several features not only make J.D. Greear’s book noteworthy; these features make this book one of the best Christian books of 2014. Jesus Continued is saturated in the Reformed tradition. While the author writes with Reformed convictions, his focus is on the Holy Spirit which should encourage charismatics and challenge Reformed thinkers. Jesus Continued is a fresh look at the person and work of the Holy Spirit by a pastor who has a heart for theology and a love for the people of God. Jesus Continued presents a pneumatology which is Scripture-soaked. Jesus Continued is a personal work and practical work. While this is the work of a top-notch scholar, the writing is simple enough for a high school student to understand but will also challenge seasoned pastors. I highly recommend Jesus Continued. I trust that it will receive a wide readership and that God will use it in mighty ways. May Christ-followers surrender afresh to the ministry of the Holy Spirit! The origins are the charismatic movement are explored in a fascinating biographical account of Charles Parham – founder of the Apostolic Faith Movement. Parham’s was discredited by his ungodly character and false teaching. As a result the movement as a whole was subject to suspicion from the start. The questions noted above are prompted by Jonathan Edwards’ fine work on this biblical passage. MacArthur not only helps readers develop biblical discernment; he includes numerous examples of charismatics who have abandoned the truth of God’s Word and as a result ignored the prompts of the Holy Spirit. In part two, the author cites concrete examples of a movement that has moved from bad to worse. While some leaders like C. Peter Wagner affirm the beginning of the Apostolic Age, MacArthur rightly argues that the canon is closed: “Hence, the writing so the New Testament constitute the only true apostolic authority in the church today.” The author argues strenuously that the office of apostle was unique to the first century church, an office that faded away and no longer necessary with the closing of the canon. 1. Anyone who leads people into false doctrine and heresy. 2. Anyone who lives in unrestrained lust and unrepentant sin. 3. Anyone who proclaims any supposed “revelation from God” that turns out to be inaccurate or untrue. Finally, two so-called faith healers are examined: Oral Roberts and Benny Hinn in what proves to be one of the most interesting chapters in the book. The conclusions are clear and decisive. Part three includes a robust treatment of the person and work of the Holy Spirit. The author uncovers the Spirit’s role in salvation, sanctification, and the Word of God. The biblical contrast with the previous two sections could not be clearer. Charismatics are encouraged to carefully read this section and contrast MacArthur’s treatment with what currently resides in the modern Pentecostal sanctuary. The charismatic movement is carefully evaluated through the lens of Scripture in Strange Fire. The critique is forthright and charitable. But the criticism is not for the faint at heart. Readers should approach Strange Fire with a biblically informed worldview and be prepared to make necessary adjustments. “God is spirit, and those who worship him must worship in spirit and truth” (John 4:24). We must worship God in the way that he prescribes. To move outside the boundaries of Scripture or invent man-made models is tantamount to idolatry. Forgotten God by Francis Chan is an introductory book about the person and work of the Holy Spirit. The subtitle describes the essence of the book, namely – Reversing Our Tragic Neglect of the Holy Spirit. Many churches through fear or ignorance have done just Chan suggests; they have neglected the Holy Spirit. And the net results are tragic indeed. Each chapter includes a brief explanation of the person and work of the Holy Spirit. At the end of each chapter, the author includes a short vignette of real life characters who exemplify a life led by the power of the Spirit. Forgotten God reveals much about the author. This is solid writing that is clear and biblical. High school students and first year Bible College students will benefit greatly from Chan’s insight. This book may be the most helpful starting point for anyone seeking an introductory look at the Holy Spirit.